We accept reservations during lunch and brunch. Click here to make your reservations today! Due to the size constraint of our restaurant (and because our burger is so damn good), we do not accept reservations after 3:30pm. Additionally, it can be difficult for us to accommodate large groups during peak hours; to better serve our guests, groups of 6 or more cannot be guaranteed seating together. A buyout is available for large parties. To learn more, please contact our Events Team by email at pa.events@garcesgroup.com or by calling 267-284-7979. Featuring a comprehensive selection of more than 200 whiskeys alongside what has been called the country’s best burger, Village Whiskey is an instant classic. Envisioned by Chef Garces as a spot where he and his team could enjoy a drink and a snack after a long night in the kitchen, the restaurant’s focal point is the central bar that is home to their near-encyclopedic catalogue of Chef Garces’ favorite spirit, whiskey. Our able bartenders shake and stir classic and contemporary cocktails in a space evocative of a Prohibition-era speakeasy. Since opening his first restaurant less than a decade ago, Chef Jose Garces has emerged as an enormous talent and one of the nation’s most gifted chefs and restaurateurs.Today, he is the owner and operator of more than a dozen restaurants across the country, plus a thriving event planning division and 40-acre Luna Farm. He is a 2009 winner of the James Beard Foundation’s prestigious “Best Chef, Mid-Atlantic” award and one of only a few chefs in the country to hold the coveted title of Iron Chef. Chef Garces is also the author of two cookbooks, The Latin Road Home (Lake Isle Press, October 2012), a culinary and cultural tour of Ecuador, Spain, Mexico, Cuba and Peru, and his stunning first cookbook, Latin Evolution (Lake Isle Press, Fall 2008). 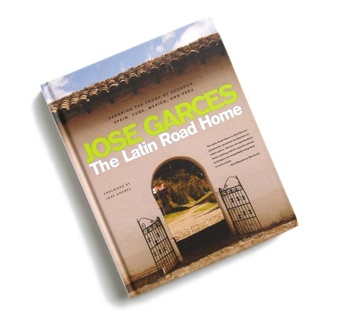 “The Latin Road Home” is more than Chef Jose Garces’ new cookbook: it’s also a travelogue and a memoir, offering a fascinating and personal look back at the food traditions that have shaped his culinary career. Village Whiskey is the ideal venue for an event focused on great spirits, great cocktails and of course, great burgers and bar snacks. Village Whiskey’s website has a new look! Let us know what you think. Sign up to receive exclusive email announcements about special events and offers from Village Whiskey Philadelphia.